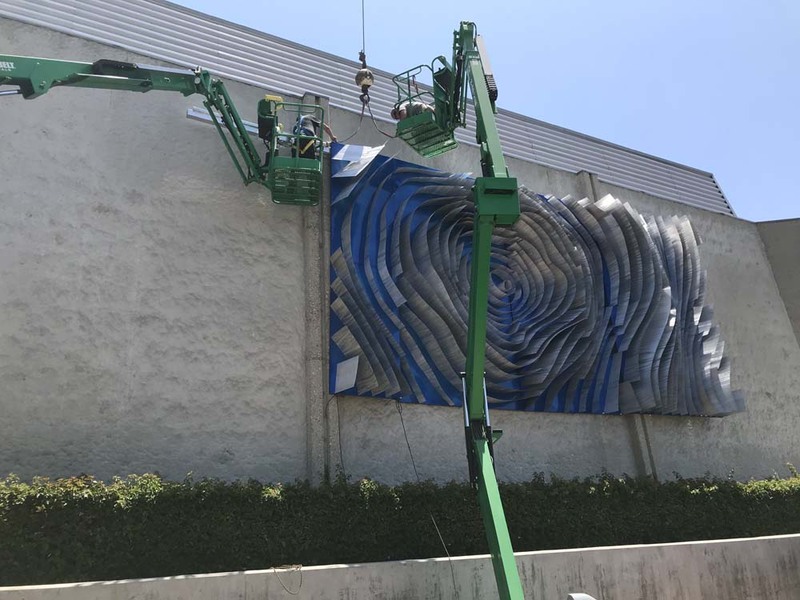 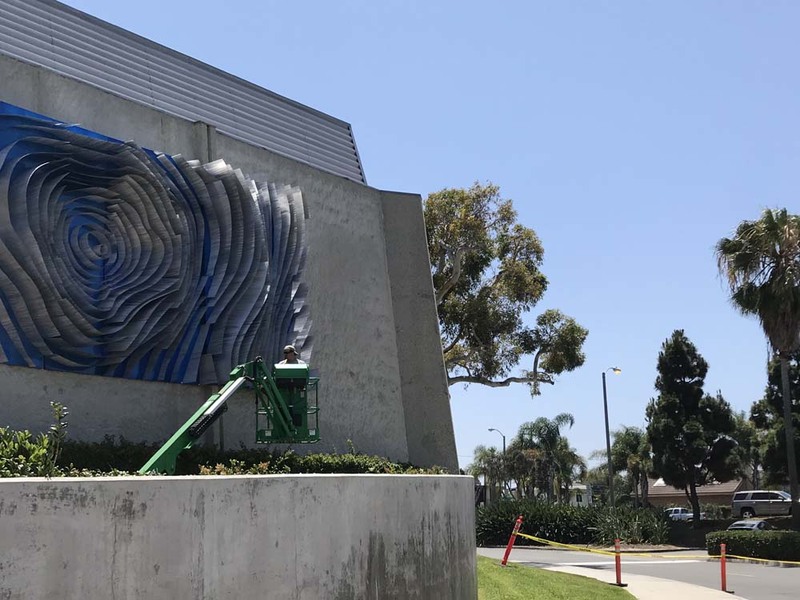 Waves was commissioned by the City of Redondo Beach and is the first public art commission funded by the John Parsons Public Art Fund. 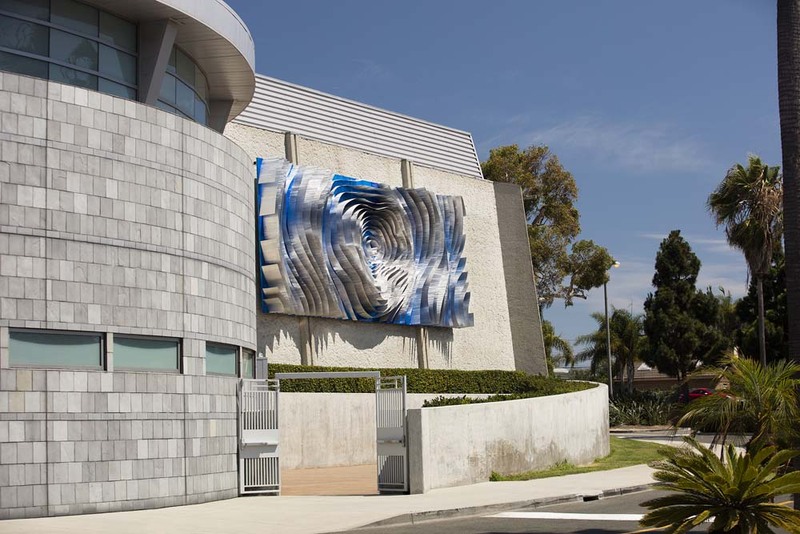 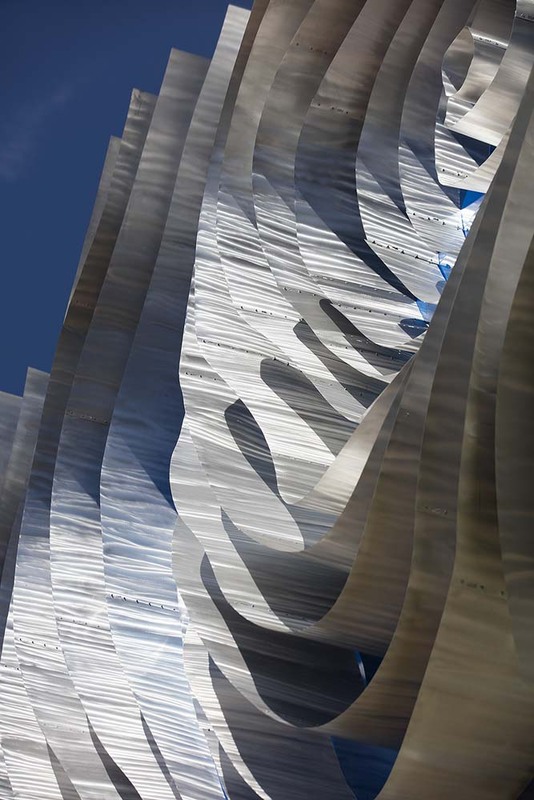 The 15′ x 37′ custom, large-scale aluminum sculpture adorns the exterior of the Performing Arts Center and distinguishes a major entry point of the city. 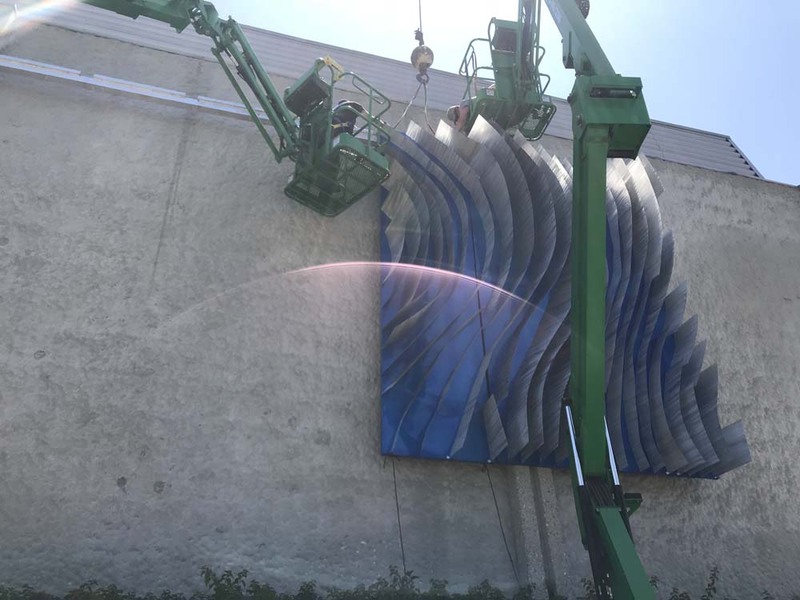 The city’s Public Art Program has an inventory of 30 works, and Waves is an achievement in the city’s efforts to inspire community through public art. 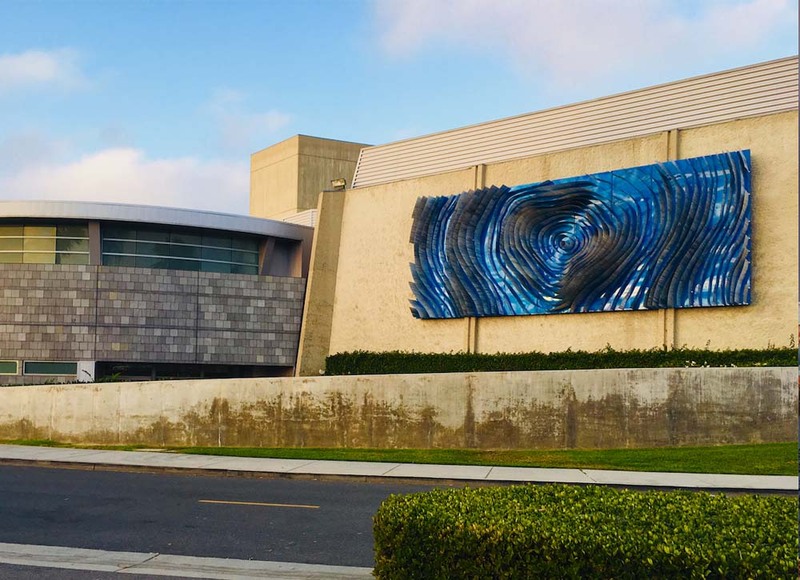 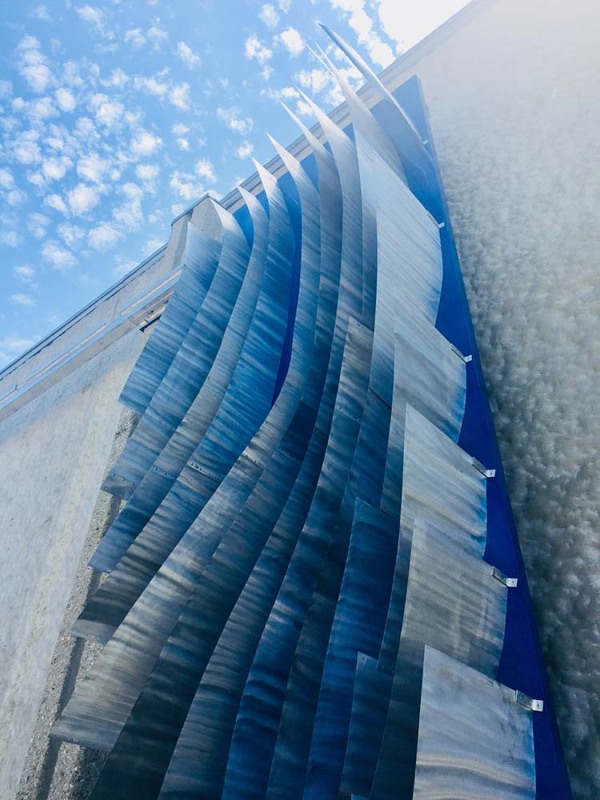 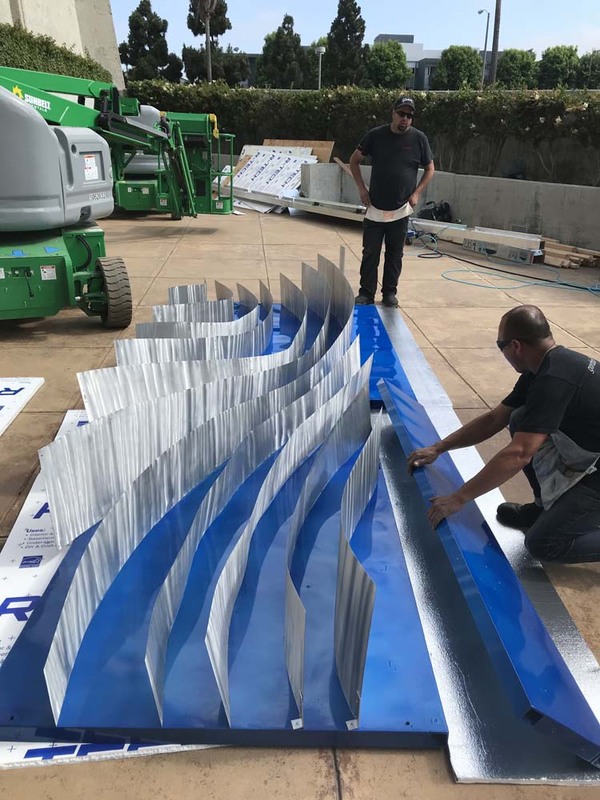 Selected by the Redondo Beach Public Art Commission from a set of 39 artist proposals, Waves shares the dual inspirations of the physical properties of sound waves produced by live music performance and natural ocean waves and shifting tides. 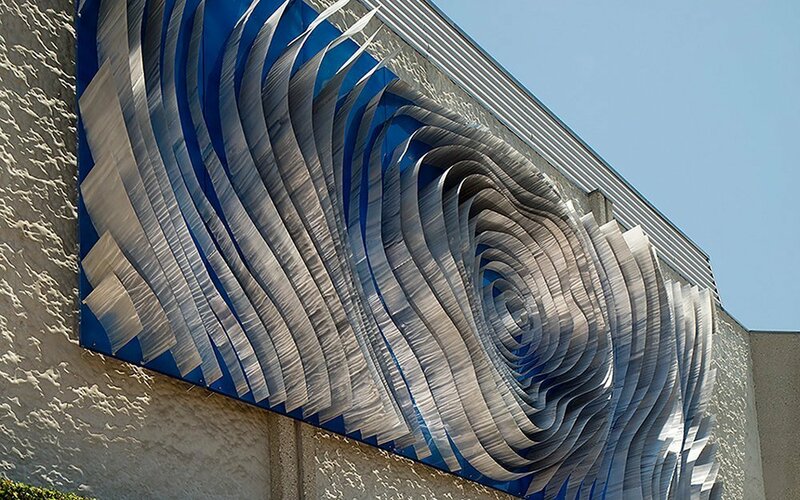 Mounted to the west-facing exterior of the Performing Arts Center, this concept infuses the installation with identifiable reference points that will spark a variety of interpretations and public engagement. 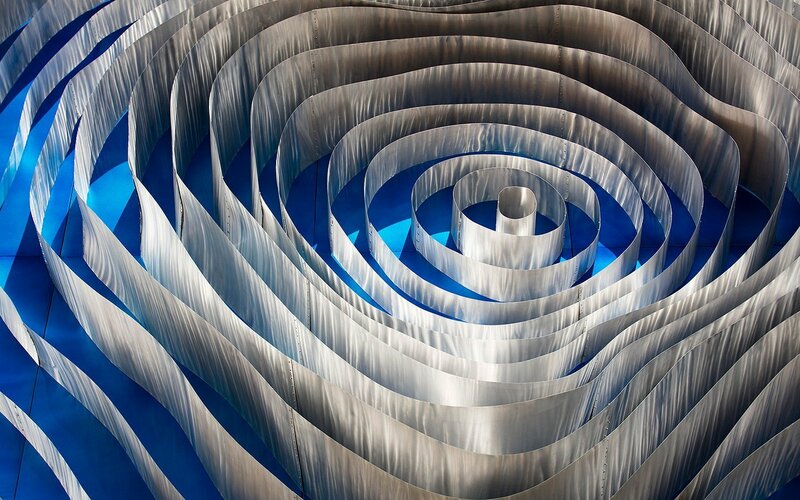 The work is fabricated with rippling concentric fins of brushed aluminum that rhythmically emanate from the center of the work, emerging sinuously and gracefully from the wall and undulating in depth, height and length. 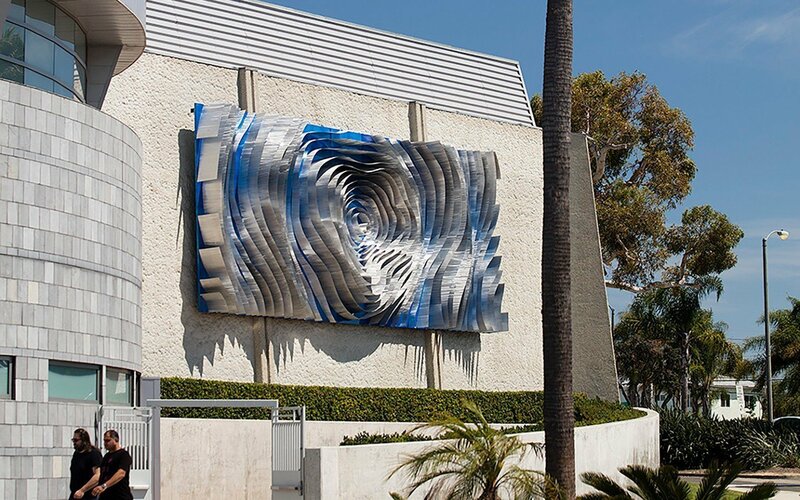 The result is an installation that projects shadow and “movement” throughout the day and night. 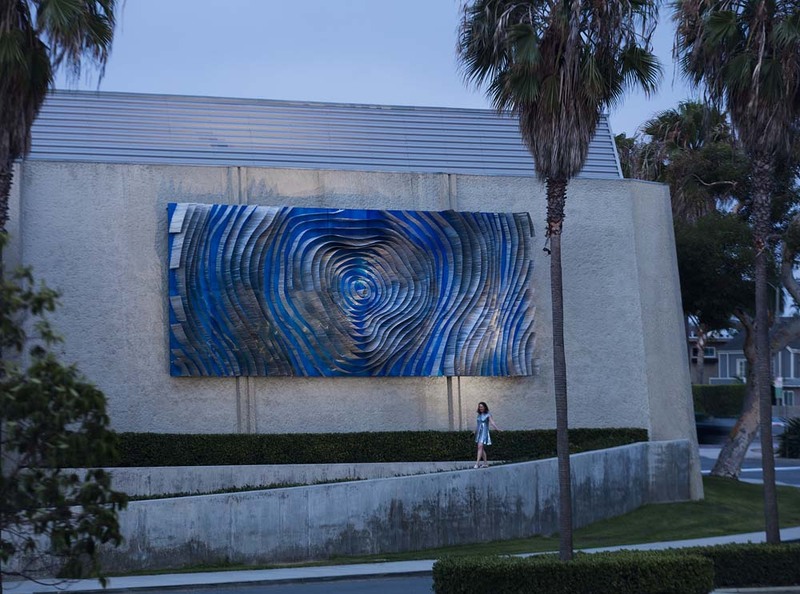 The sculpture is anchored by a vibrant blue plate, which provides an energetic field of color in contrast to the neutral exterior concrete wall. 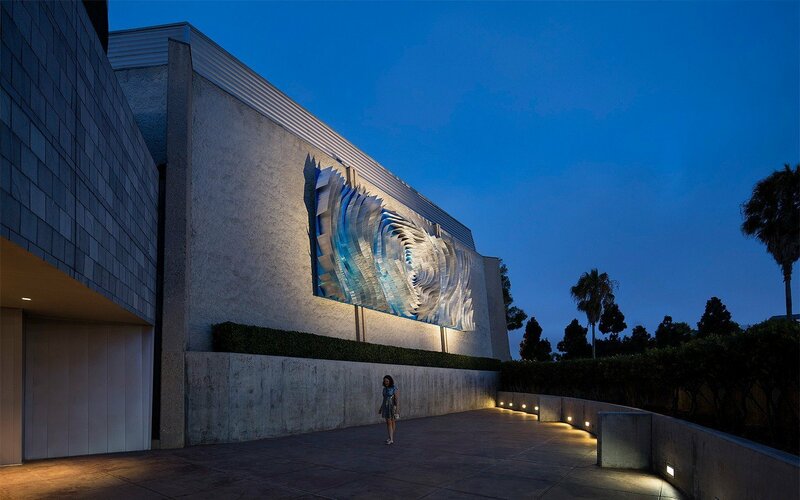 The artwork is illuminated at night to further enhance the dynamic nature of the installation. 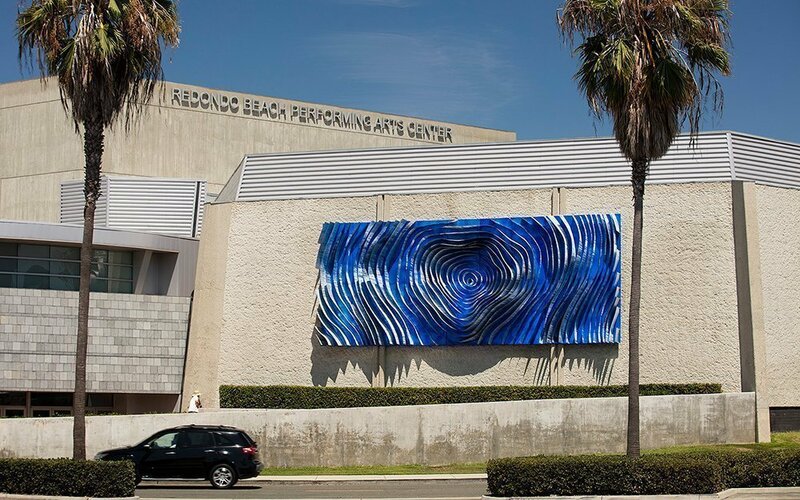 The Redondo Beach Performing Arts Center, located at 1935 Manhattan Beach Boulevard, is a popular cultural destination for South Bay residents. 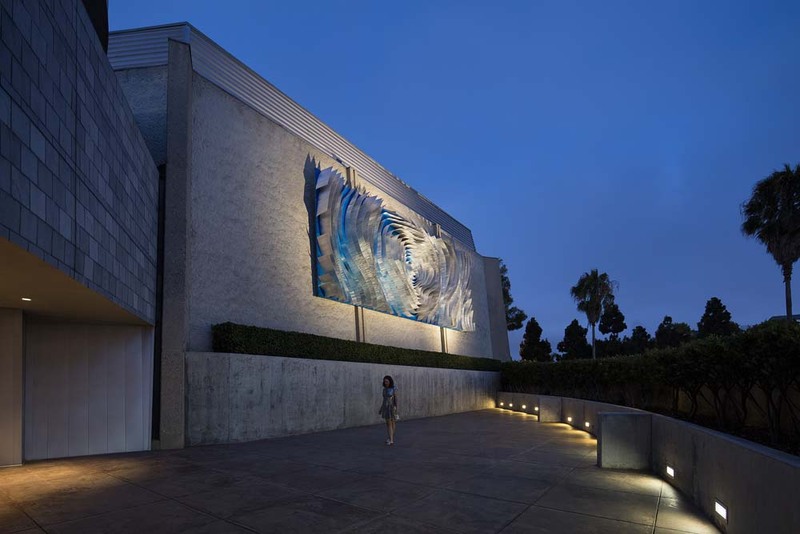 A state-of-the-art facility, it is home to a myriad of community and privately produced concerts, performances and special events.